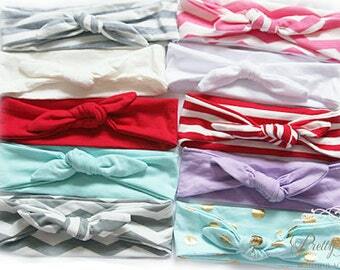 Announcement ♥ Our Baby Girl Headbands come in a variety of styles and colors. They make beautiful photo props, are perfect for birthdays or other special occasions, and are stunning everyday accessories. 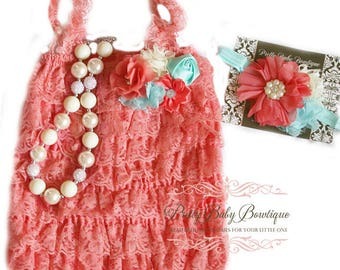 Our headbands can be paired with our matching ruffled lace baby rompers and bubblegum necklaces. If you don't see a set you love we can mix and match the baby headbands and necklaces to make a custom romper set for you. Our baby girl headbands come in two different sizes. Newborn 0-3months is cut at approx. 13"
Regular 3m-Toddler is cut at approx. 15"
Clips- Most listings have and option in the size drop down to have the flower or bow made on a clip instead of the headband. If you need a larger size headband please contact us and we can customize the size for you. ♥ NEW FACEBOOK FANS GET 10% OFF THEIR PURCHASE!!! ♥ Our Baby Girl Headbands come in a variety of styles and colors. They make beautiful photo props, are perfect for birthdays or other special occasions, and are stunning everyday accessories. 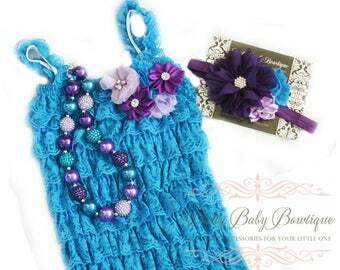 Our headbands can be paired with our matching ruffled lace baby rompers and bubblegum necklaces. If you don't see a set you love we can mix and match the baby headbands and necklaces to make a custom romper set for you. 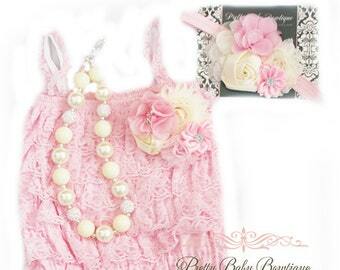 Welcome to Pretty Baby Bowtique!!! My name is Summer: I started out making items for my own baby girl and then for family and friends, I really enjoyed it and decided to open this store in 2008 and have been selling online and in high end boutiques ever since. I now have 4 children and I'm a stay at home mom. Because of the crazy busyness that comes with raising 4 children I also have an assistant that helps me part time. I love creating and making items. I love being able to, in some small way ,be a part of peoples special moments and love when customers send me pictures of their little ones in our accessories. Although I love staying at home with my kids this little business keeps me sane, it is my outlet and I love it! Custom items are nonrefundable. Because these are one of a kind items and we work with the customer to create them. All other items are we accept returns or exchanges~ See below for more info on regular returns. We pride ourselves on customer service. We want you to be completely happy with your purchase. If for any reason you are not completely satisfied with your purchase please contact us immediately. We will do whatever it takes to ensure your happiness, even if that means a return or exchange. Returns or exchanges must be done within 1 week of delivery, returns or exchanges not postmarked within that time frame will not be accepted. ♥ PROCESSING TIME: Check specific items for current processing time- it will be shown next to shipping cost and will be shown when item is added to your cart. In addition, first class shipping usually takes 3-5 business days (in the continental US). You can upgrade to priority shipping at checkout- priority shipping is usually delivered within 2-3 business days (in the US) The postal service will not guarantee delivery dates. Orders are processed in the order they are received. ♥ RUSH PROCESSING AND UPGRADED SHIPPING rush processing is not available at this time. Priority shipping upgrade is available at checkout- priority mail is usually delivered within 2-3 business days. Regular processing time of 2-3 business days still applies, it is only the shipping process that you are upgrading. ♥ INTERNATIONAL PACKAGES: are also shipped first class and usually take 2-4weeks to arrive, but may take as long as 6-8weeks to be delivered. ♡ PLEASE NOTE: Orders are not considered "Lost" in transit until 8 weeks has passed. If your package has not arrived within 8 weeks please contact me. 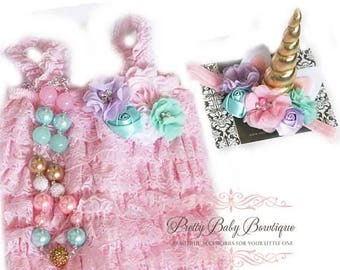 ♥ Pretty Baby Bowtique is not responsible for packages once the post office marks them as delivered. All packages in the United states come with delivery confirmation, you can add insurance for an additional charge. ♥ Packages will only be shipped to the shipping address you give paypal. If you are shipping to a gift recipient you will need to edit the mailing address during checkout. PLEASE BE AWARE: Some products may contain small parts, this can pose a choking hazard. Do not leave small children unattended, while they are wearing our accessories.